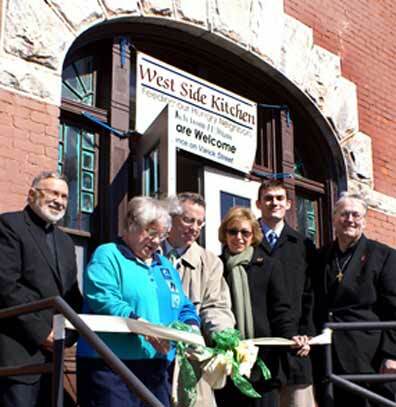 UTICA, NY, Oct. 24, 2010 --The Resource Center for Independent Living (RCIL) presented its Community Support Award to Deacon Gil Nadeau and the volunteers of Mother Marianne’s West Side Kitchen during that advocacy agency’s annual meeting on Oct. 19 in Utica. 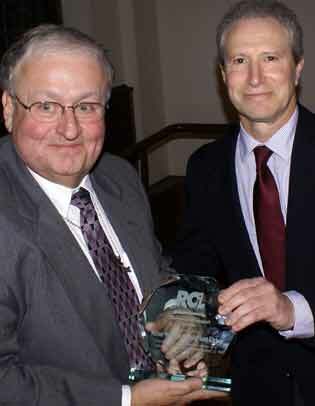 Deacon Gil Nadeau (l) accepts award on behalf of soup kitchen volunteers from RCIL's David Lowitz. RCIL, which serves people with disabilities from Amsterdam to Utica to Watertown and the Adirondacks, has worked with the soup kitchen to provide services and referrals to patrons seeking assistance. Lowitz also noted that the parish center at St. Joseph-St. Patrick Church, where the soup kitchen is housed, hosts meetings of the Mohawk Valley Homeless and Housing Coalition, and that the deacon’s concern for homeless young men is resulting in the establishment of the John Bosco House, expected to open in late January. In collaboration with the Homeless Coalition and the City of Utica Action Plan, Deacon Gil said, he and a group of deacons began the John Bosco House project. He thanked “many social service agencies” that aided in the effort, along with the Community Foundation of Herkimer and Oneida Counties Inc., which awarded $100,000 in start-up funds. The deacon also offered a special thankyou to the Diocese of Syracuse and Bishop Robert Cunningham for gifting the former St. George Church property on Lafayette Street for the project. In addition, the Mohawk Valley Community Action Agency donated 12 full bedroom sets, and “many local businesses and individuals have given in-kind donations and assistance.” John Bosco House will initially house six young men, he said, with around-the-clock live-in supervision. Eventually, he said, the shelter will house up to 18 young men. The soup kitchen serves lunch Monday through Saturday to the working poor, the unemployed and the homeless. Located at St. Joseph-St. Patrick Parish Center, the soup kitchen is named after parish daughter Bl. Mother Marianne Cope, missionary to the lepers of Hawaii's Molokai.